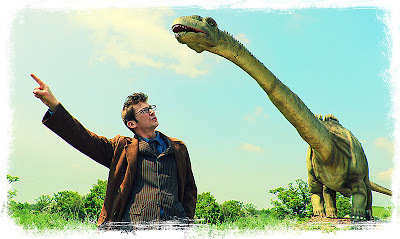 Last year I did a big photoshoot with my friend and Tenth Doctor look-a-like Kevin Coppa. One of the locations we used was a local golf course - which is inhabited by dinosaurs! As I reported last September, the dinosaurs were under threat as planning permission had not been sought for their construction! Well this week there was good new. 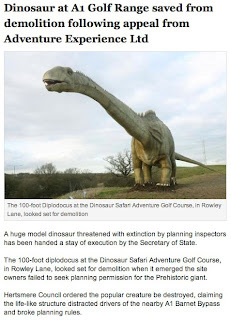 After an appeal to government they have been given a reprieve, so long as the largest dinosaur is relocated from its current position to a site less visible from the main road that passes only yards away.